MARPOL Annex VI NOx Technical Code explained - Website of marpol-annex-vi! MARPOL Annex VI, as first adopted in 1997, and entered into force 19 May 2005, limits the main air pollutants contained in ships exhaust gas, including sulphur oxides (SOx) and nitrous oxides (NOx), and prohibits deliberate emissions of ozone depleting substances. MARPOL Annex VI also regulates shipboard incineration, and the emissions of volatile organic compounds from tankers. 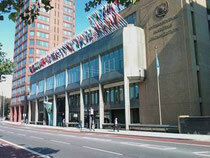 The revised Annex VI entered into force on 1 July 2010, sets limits on sulphur oxide and nitrogen oxide emissions from ship exhausts as well as particulate matter and prohibits deliberate emissions of ozone depleting substances, such as hydro-chlorofluorocarbons. Stricter standards are set for Emission Control Areas designated by IMO (Baltic Sea, North Sea and North America). Under the revised MARPOL Annex VI, the global sulphur cap is reduced initially to 3.50% (from the current 4.50%), effective from 1 January 2012; then progressively to 0.50 %, effective from 1 January 2020, subject to a feasibility review to be completed no later than 2018. The limits applicable in ECAs for SOx and particulate matter were reduced to 1.00%, beginning on 1 July 2010 (from the original 1.50%); being further reduced to 0.10 %, effective from 1 January 2015. 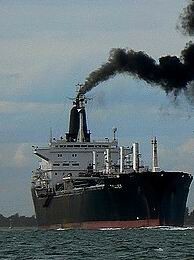 Progressive reductions in NOx emissions from marine diesel engines installed on ships are also included, with a “Tier II” emission limit for engines installed on or after 1 January 2011; then with a more stringent "Tier III" emission limit for engines installed on or after 1 January 2016 operating in ECAs. Marine diesel engines installed on or after 1 January 1990 but prior to 1 January 2000 are required to comply with “Tier I” emission limits, if an approved method for that engine has been certified by an Administration. The revised NOx Technical Code 2008 includes a new chapter based on the agreed approach for regulation of existing (pre-2000) engines established in MARPOL Annex VI, provisions for a direct measurement and monitoring method, a certification procedure for existing engines, and test cycles to be applied to Tier II and Tier III engines. Revisions to the regulations for ozone-depleting substances, volatile organic compounds, shipboard incineration, reception facilities, and fuel oil quality have been made with regulations on fuel oil availability added.